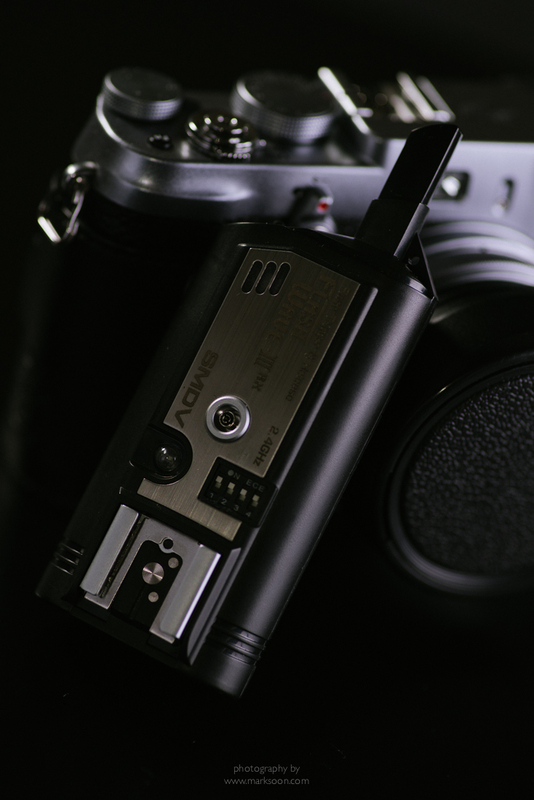 The Flashwave 3 is a lesser-known wireless radio trigger created by a Korean company, compared to the Pocket Wizards which a lot more photographer are familiar with. I know a lot of Fuji X100 owners are going to find that this trigger is a match made in heaven with their cameras. I have used the Yongnuo as well as Cactus V5 triggers for my Nikon in the past but when I bought the Fuji X100S, these triggers I found were way too large for comfort on the Fuji. What caught my eye with these Flashwave's is the transceiver - it's so tiny! When mounted on the Fuji X100 (see first image above), the transceiver does not get in the way and it is so light that I almost forget that it's there! Compare that to the PW's, Cactus V5's or the Yongnuo's where the transceiver is so much larger that when you put the camera up to your face, it actually pushes into your forehead. Unlike the other cheap China-made triggers out there, these are extremely robust and have the same build quality as the PW's. Everything is extremely well-made from the solid/rugged plastic casings with metal plates to the finer chrome like test-fire button on the remote itself. The only thing that feels a little cheap is the actual on/off switch on both of the devices - it feels a little bit wobbly like it's going to fall off (it won't, don't worry). The front face of the receiver features a hotshoe along with a flash sync port and tiny little flip switches to configure the channels. The switches are so tiny that unless you have really long nails, it'll be difficult to accidentally flip those switches and that is why the Flashwave kit comes with a lanyard and a little plastic spike accessory that allows you to modify the channel switches. Ah, sync speeds - the reason why most of us bought the x100s. The leaf shutter in the camera allows us sync our strobes and speedlights at ridiculous speeds to knock out the sunlight without almost never ever having to close down the aperture. I'm happy to say that the Flashwave III performs perfectly in this respect. I was able to hit 1/2000th of a second from f2.0 - f2.8 without issues. Moving up the shutter to 1/3000th, which was really pushing it, the shot went all black (failed to sync past that). But 1/2000th is really really crazy stuff guys, if you compare that to the sync speed of Canon and Nikon full-frame cameras at 1/200-1/250th. This knocks daylight right out of the park. I really recommend this trigger as it's probably the neatest looking trigger I've ever owned (and the smallest!). The set of trigger and receiver set me back around $237 so it's not cheap. You could get yourself a set of Pocket Wizard Plus X's for that money, but you also get a much larger transceiver in return - large enough to look kinda stupid on the Fuji X100s. Hope this review cleared things up for those of you who have been sitting on the fence. If you have any questions, I'd be happy to try and answer them. Just leave me a comment below.